Sorry... the 2017 GMC Acadia is no longer being sold as new. 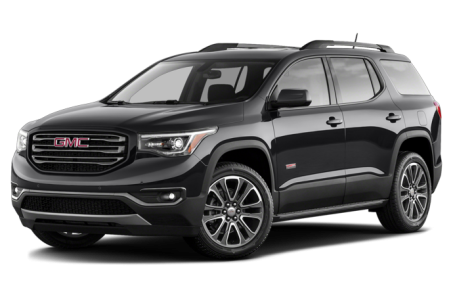 Instead, take the first step to a great deal on 2019 GMC Acadia with a free price quote! The 2017 GMC Acadia has been redesigned for 2017. It is a mid-size SUV that has been significantly downsized. Previously, the old Acadia was able to seat up to 8 passengers. Now, the new Acadia can only seat up to 7 passengers, but it weighs 700 pounds less than its predecessor and handles much better. It is 7.2-inches shorter, 3.5-inches narrower, and 4.4-inches lower than the 2016 model. Six trims are available: the SL, SLE-1, SLE-2, SLT-1, SLT-2, and Denali. The Acadia has a sleeker, softer appearance than its previous design. Prominently displayed is a bold, octagonal front grille, which is bordered by narrow-slit, geometric headlights. Chrome accent strips adorn the exterior of the Acadia, giving it a more premium look. The rear-end features blacked-out D-pillars. Standard features LED daytime running lamps, power/heated side mirrors, and 17-inch aluminum wheels. A power liftgate, front fog lights, a trailer hitch receiver, roof rails, a dual-pipe exhaust system, and larger 18-, 19-, or 20-inch aluminum wheels are also available. The Denali model comes with unique rear styling and chrome treatments for the grille, side molding, and door handles. It also comes with an adaptive suspension system that actively adjusts shock absorption to different road conditions. Under the hood, the Acadia is powered by a standard 193-hp, 2.5-liter 4-cylinder engine mated to a 6-speed automatic transmission and front- (FWD) or all-wheel drive (AWD). A more powerful 310-hp, 3.6-liter V-6 is also available for the SLE-2 and higher trim levels. A dual-clutch AWD system is available for trims that have the All-Terrain package equipped. The dual-clutch system transfers power between the rear left and right wheels for optimal traction. Fuel economy for the 4-cylinder model is an EPA-estimated 21/25 mpg city/highway. The rating lowers to 18/26 mpg for the V-6 model. Inside, the Acadia has a premium cloth interior with a 60/40 split-folding second-row seat and a 50/50 split folding third-row bench seat. Second-row captain’s chairs are available for a total of 6 passengers. The center stack features a standard IntelliLink multimedia system that includes 7-inch touchscreen, a satellite radio, Bluetooth connectivity for phone and audio, OnStar 4G LTE connectivity with Wi-Fi hotspot, and Apple CarPlay/Android Auto compatibility. It can be upgraded to a larger 8-inch touchscreen, an integrated navigation system, and a Bose premium audio system. Standard features include tri-zone automatic climate control and remote keyless entry. Available features include leather upholstery, heated/ventilated front seats, heated rear seats, remote vehicle start, an automatic dimming rearview mirror, a memory seat, and a power moonroof. The 5-passenger All-Terrain Package conversion has a 2-3 seating configuration with a second-row, 40/20/40 split-folding bench seat. Standard safety features include a backup camera and a tire pressure monitoring system. Available features include surround view camera, a blindspot monitoring system, lane departure warning, rear cross-traffic alert, front and rear park assist, forward collision alert, and low-speed automatic braking. 64 of 71 (90%) consumers said they would recommend this vehicle to a friend.